Balcony with Ocean View! 3rd Floor. Comfy King Bed, Hallway Bunks. Looking for a comfortable Destin Florida condo? Look no further! Looking for a couples-only, small dog pet friendly spacious and comfortable Destin Florida condo? This roomy condo is just 1/2 block to the private beach and close to the north pool, tennis courts, clubhouse and fitness room. Newly renovated by a professional decorator. 3rd floor balcony has a view of the Gulf. Small dog pet friendly. No children allowed in this unit. Free wireless high-speed internet. Free Beach Service (2 Chairs & Umbrella) provided March-October. Call or book online today! "My husband and I came here for our honeymoon and had a wonderful time! We loved the condo and the private beach and plan on coming back in the future! Such a lovely place to go for our vacation! We ate plenty of great food too! :)"
Cindy, who stayed at Maravilla 4302, said: "This was a great Condo location. 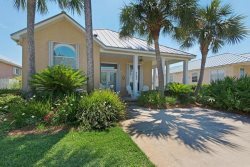 Close to the pool, fitness center, and beach. The Condo was beautiful and well kept and equipped. Would recommend this to anyone heading to Destin." Charley, who stayed at Maravilla 4302, said: "The description of the room was accurate. Our entrance to the beach was right across the street. The room itself was clean, comfortable, and well stocked with the things we needed for it to be a home away from home. I highly recommend." Ryan, who stayed at Maravilla 4302, had these comments: "We had a blast!!! Great condo, great location, overall great!!! Thanks"
We had a great time. Room was just as advertised and the location was great. Walking distance to several dog-friendly spots. After trying seafood all over Destin, Kenny Ds right near the condo was the one we kept coming back to. Overall we were very satisfied and so was our dog! This is a great condo for the price, and Miramar Beach is gorgeous.